I’ve been persevering with Commando on iOS, complete with dreadful touch controls, since it appeared in its Japanese “Wolf of the Battlefield” guise a couple of months ago. But there was no way I was going to let something like that spoil an arcade-perfect version on my phone, so I played and played until the frankly bizarre nature of the controls was meaningless and I saw this screen for the first time ever! During this Christmas period, we played a ton of Winter Games and Commando at his house. And probably Oh Mummy! at mine, but the less said about that the better. I have to admit that Commando, as great as it was, wasn’t quite what I expected – where was Arnie??? His film of the same name had come out the previous February, and despite it having an 18 rating and me being 14 (and looking 12), I’d obviously seen it just after release thanks to the magic of pirate video! When we’d started upper school at Bedford’s St Thomas More the previous year, there’d been an influx of kids from Milton Keynes, about 15 miles away and without a Catholic school of its own, so they were bussed in; and out, fifteen minutes earlier than us Bedfordians, much to our chagrin. Naturally, after a few months friendships formed, and I became friends with a kid called Clive. Back in those days, the modern metropolis of Milton Keynes had Sky TV, which just wasn’t available to us yokels. He talked about American wrestling a lot, which the rest of us got to see once or twice a year as a special treat in the Saturday afternoon ITV wrestling slot, though my only real recollection of this was a guy called Moondog Rex… when I later became an WWF connoisseur, I learnt that he had a tag partner called Moondog Spot. The Moondogs. Great days. Anyway, at some point he lent me a video of that week’s WWF show, which was the one where Macho Man dropped the ring bell off the top rope onto Ricky The Dragon Steamboat’s throat. And that hooked me, so he’d start recording it every week for me. And along with that the movies started to flow, generally filmed off a primitive camcorder in a cinema, complete with people walking by to go to the loo. Notably that year, we had Platoon, Top Gun, Highlander and Cobra, which was a close second to my favourite pirate video that year, Commando, with Arnie as a retired special forces guy on a massive killing spree to rescue his daughter, Alyssa Milano, who’d grow up to be a right old sauce pot. This film influenced me so much that I actually bought a camo stick like he used for my face; I never used it, but it was probably a safer bet than buying a massive gun and not using it. At some point in the distant past I was talking about a video game, and the point is that despite sharing a name with this film, it was actually nothing to do with it. Which took about thirty seconds of play to stop being a problem. 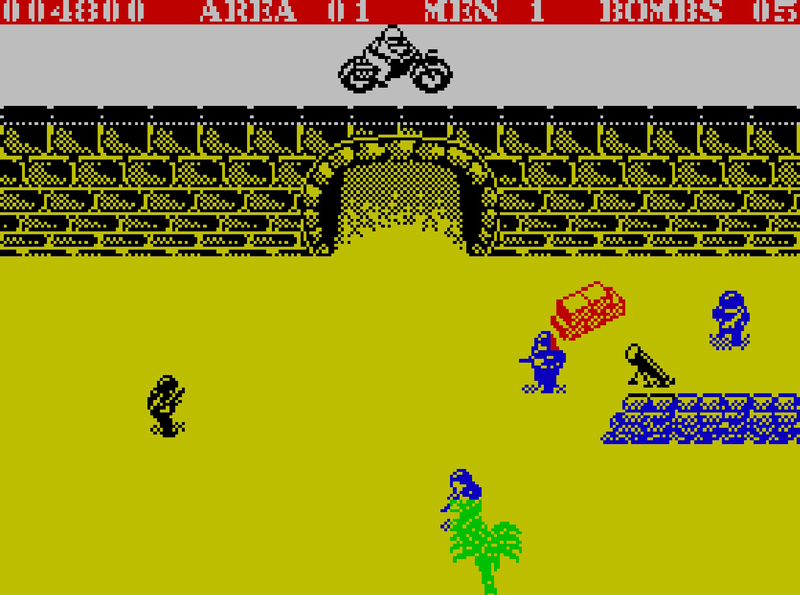 There may have been no Arnie, but the premise was the same – you’re a crack commando travelling up the screen, shooting everything in sight, lobbing your limited supply of grenades and freeing the odd hostage across eight areas on the way to taking out the enemy fortress. When I picked up the Spectrum version at some point in 1987, it took a few more seconds than that to get over a different problem, which was the graphics. Or more specifically, the colours. 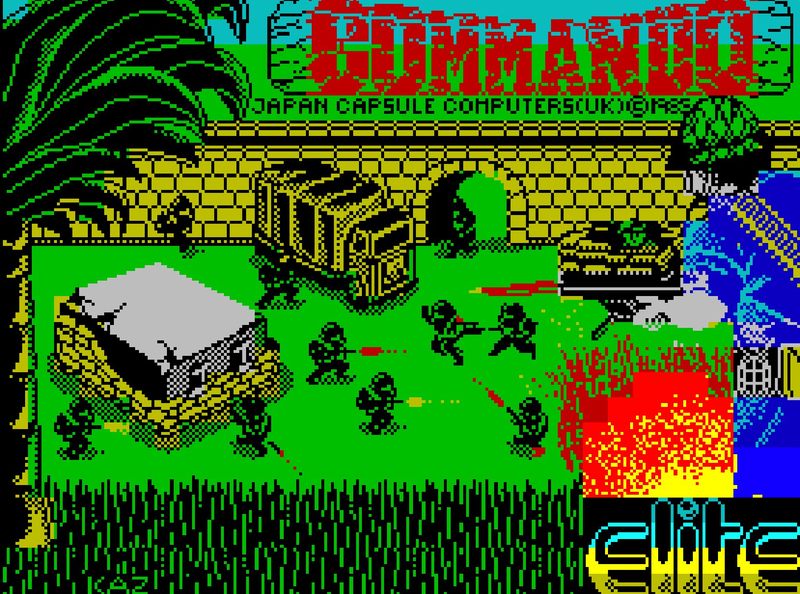 The loading screen is kind of what would have you’d have expected of the Spectrum, with all colour removed, but the developers had other blue and red and yellow ideas for the game itself, which resulted in some lovely colour clash if one of the enemy soldiers ended up behind a tree! Aside from the colours though, this was another great conversion. The graphics are beautifully detailed and everything seemed to have been translated over from the arcade machine in all the right places – something else that the new iOS version revealed! It’s missing the great C64 tune, of course, but the sound effects are fine. The gameplay remains outstanding though, with a relatively easy first area that culminates in a frantic onslaught out of the first mini-fortress, but then the action really heats up with bunkers, bazookas, gun emplacements and barracks full of enemy soldiers appearing from all directions. It controls so well though that it rarely feels unfair when you die, generally in the second area if you’re as skilled at playing as I am, which kind of negated the high score table for me – it was only ever about getting to the third area!